One of the best gifts from doing Ironman in my mind is the ability to multitask. How we juggle and try to keep balance is a skill that needs work daily. Raynard officially retired from the sport after more than 2 decades of racing triathlons. 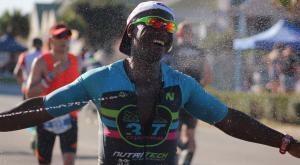 He started competing in triathlons at the age of 16 at the 1st 5FM/Energade triathlon. He was successful from the start and immediately became hooked onto this challenging multi-disciplined sport. 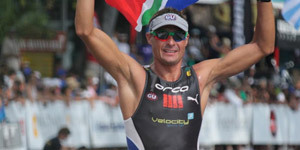 He has achieved success in all distances of the race, with numerous SA titles from Sprint Distance, Olympic, Half Ironman, Ultra to Ironman distances. 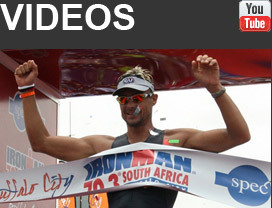 His 1st Ironman was the Ironman South Africa event in Gordon’s Bay in 2000, where he finished 10th. From there he went on to Malaysia in 2001 and finished in 3rd place. Ironman South Africa in 2001, saw him finish 2nd behind multiple Ironman Champion – Lothar Leder. It was this race that fuelled his immense passion and drive to excel in this challenging sport. In his 4th Ironman in Korea, he took his first Ironman win and went on to compete in 33 Ironman events. IRONMAN Korea in 2002 and 2007, IRONMAN Canada in 2003, IRONMAN South Africa in 2005, 2010 and 2011, IRONMAN Wisconsin in 2009 and IRONMAN Austria in 2005. 4 Top Ten finishes at the Ironman World Championships in Hawaii. Natalie has been at Raynard’s side since 1994. They were married in 1996 and their children, Kade and Jordi, were fortunate enough to share a lot of the triathlon journey with them. Natalie brings over 25 years of teaching, coaching and racing experience in swimming and triathlon. Natalie is a past South African National swimming champion, a Springbok life saver and South African triathlete – with numerous victories both locally and internationally. Natalie has started an online Team Tissink Coaching business in 2006 when Raynard was still racing professionally, and built up a steady following of athletes – many whom are still training with the Academy today. She swam competitively from the age of 7 through until after matriculating, and started racing triathlons 2 years after leaving school. Natalie started coaching swimming in Sandton at the age of 18. Her swim school continued to grow until she had 6 teachers working for her at Morningside Virgin Active. She then expanded the business and opened franchises in Cresta, Benoni, Northgate and at their home pool in Weltevreden Park. After several years of racing professionally overseas for 4-5months of the year, Natalie and Raynard decided to move to PE for a quieter life-style and better training environment. SO, in 2005, they sold the business and moved to PE. Health issues forced Natalie out of racing and she started the triathlon coaching business, and has been doing so ever since. Natalie is a qualified swim teacher and coach, sports massage therapist and personal trainer. "Coaching is our passion as it is our way of giving back to the sport that has given us so much and for Raynard to establish himself as one of the top triathlon coaches in the sport." They have has so much to offer, so many years of experience and wisdom to pass on to future generations and stars. Their goal is to guide youngsters, development athletes, beginners and elite athletes to achieve their own personal goals. Team Tissink reguarly run triathlon training camps, travel packages to various races, and offe hands on coaching to athletes of all levels. Interested? Get started by completing our questionnaire. Team Tissink Coaching Academy is made up of Raynard and Natalie Tissink, who jointly have more than 45 years of coaching and racing experience. Both Raynard and Natalie have raced around the World and know what it takes to perform at the highest level. They have helped Elite athletes achieve world records and have helped absolute beginners cross the finish line smiling. The correct nutrition can win or lose you the race. GU has seen me through many successful seasons and it's a product I believe in and recommend to everyone! My longest running sponsor, for over 14 years now. The best sunglasses around...I will support them forever!